Intelligent enough for the staff at NASA, yet clean enough for grandma Betty’s pinnochle party-Arthur’s show appeals to everyone. As if that is not enough-Arthur is good looking, quite charming and very modest when writing his own biography in third person narrative format. The shortest distance between two people is laughter. Arthur illustrates this point with his interactive comedy performance. With anecdotes, stats and demonstrations, Arthur shows how you can ‘click’ with potential clients with just a few words. Arthur criss-crosses the US bringing his hilariousness to corporate clients that demand the very best in comic entertainment. 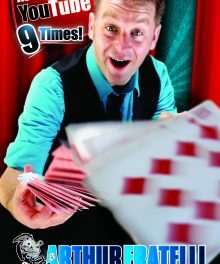 Audience participation, comedy, mentalism, and magic make this show perfect for any event requiring clean, professional entertainment. COURAGE IS DOING IT SCARED. If you wait until you are confident enough to take the stage, you may never do it! The only way to get the courage to take the stage is to do it. Confidence is learned. Arthur will teach you how to change your behavior and thinking to find your confidence and comfort zone. The ideal presentation for those in search of public speaking skills. Professional Speaker Arthur Fratelli presents this very personal, emotional, and inspirational story about the resilience of a young man, the system that tried to help, the heartbreaking choices he made.Raised by an overbearing, angry, zealous, untreated mentally ill parent, Arthur and his sister found themselves in a psychiatric hospital, homeless and hopeless. As a 16 year old Arthur was a ward of the state, struggling to find a home, a school, and someone to trust. Arthur shares these real life stories of what it’s like to be raised by a mentally ill parent in a presentation that is entertaining, honest, and an eye opening experience of someone that refuses to be called a victim. The shortest distance between people is humor. This is a high energy, interactive, funny, and memorable experience led by mentalist Arthur Fratelli. Plan on laughing, scratching your head, and never forgetting! Professional Speaker Arthur Fratelli brings a hilarious, high energy, psychological show to companies all over the US.